Katie Woo loves her Aunt Patty and she and her friend JoJo spend a lot of time visiting her. When Aunt Patty asks her to be the flower girl at her wedding, Katie is thrilled! But then she starts thinking about all the things that could go wrong. She becomes very anxious and almost wants to back out. Jojo and some of Katie’s other friends help her to get over her anxiety and participate in the wedding. Flower Girl Katie is a cute, early reader novel that kids, especially girls, will love. 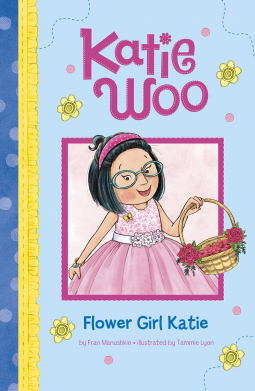 Katie Woo is a great character for young children to relate to. Her anxiety about being a flower girl will hit home for many. Her friends were entertaining as well; and I enjoyed seeing all of the kids interact with one another while trying to help Katie. I liked that the children were from various backgrounds and ethnicities. The story was quick, with good description and language for early readers. I also enjoyed the illustrations in this book. They were cute, vibrant and well executed. I would recommend this book to families and schools, especially to deal with children who have anxiety issues. My grandson has anxiety problems and this book shows that it is normal and any child would be anxious in certain situations as well as giving some simple solutions to try. A special craft project, along with a glossary and reader response questions, round out this Katie Woo story. I didn’t realize that this is a little series, but I will check out the others by Fran Manushkin. The publisher, Picture Window Books, generously provided me with a copy of this book up0n my request. The rating, ideas and opinions shared are my own. Everyday after school, Max plays hide-and-seek, his favorite game with his friends. One day, as he is hiding in the bushes, he gets stung by several bees. Upset, anxious and in pain, Max decides that he will never ever again play outside with his friends. Over the next few days, Max’s friends invite him out to do all the fun things he usually enjoys, but he will not go outside. Max is far too worried to even consider stepping outside, and gradually he begins to isolate himself. When Max’s brother asks him why he is not playing outside with his friends he tells him that he is afraid. Chris and Max have a long conversation, where Chris teaches him about a trick he calls ABC worry free. He tells him is is a special power. It works with practise and Max is able to play with his friends outside. I liked this book and the lesson it shares. It is not that easy to deal with and get over anxiety and fear, but it is a great start and with practise should achieve results. A stands for Acceptance, to recognize and accept the fear ; B stands for breathing, to take the time to breathe in and out slowly; and C stands for Change, to change the way you think about your fears and think about all the positive things you could experience, instead of all the bad things that could happen. This is a great technique, especially with children that are young. This was a great story. I really liked the illustrations, they added a lot to the story showing so much emotion on their faces. 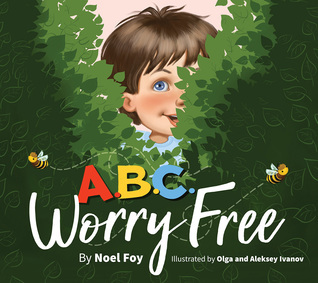 This is a great book to teach children about managing their anxiety, and to remind them that it’s ok to worry something, but not let it take over their lives. I read this with my grandson and we practised the ABCs. I don’t know if he remembers them or not, but when I see him again we will continue to practise. The National Center for Youth Issues generously provided me with a copy of this book upon my request. The rating, ideas and opinions shared are my own. In this story, Worry is a monster who lives in the main characters head. It comes out at various times such as when she takes a test or wants to play with others. Worry speaks and shouts at her saying things like, “It’s too hard” or “They don’t like you, they think you’re weird” and so on. This poor girl can’t sleep and is afraid to do much of anything. She begins to use self-talk to drown out the messages from the Worry Monster. Again, this seems like a pretty simple answer to a very big problem, but it is a start. Self-talk is a great way to overcome worry, frustration, anxiety etc. The thing is, it is something that needs to be taught if you have a child with severe anxiety issues. 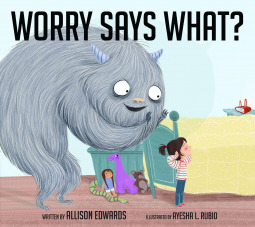 Allison Edwards has done a great job writing this book using and imaginative concept of worry as a monster. It is good to note that as we teach children monsters are not real, this could transfer to their worries as well. The situations in this book are simple ones that all children deal with, and this book could be used by parents, teachers and caregivers to deal with those simple worries. I think it would take more for a child with stronger anxiety who thinks about other things such as someone dying, fires, storms etc. I like the fact that this book helps teach children about how to deal with being worried about normal things as that is a fact of life. I also enjoyed the illustrations. The Worry Monster was great and gives the reader something real to look at. The young girl showed expressions throughout the story that could be discusses showing her confidence build. Overall, “Worry Says What?” is a good book about dealing with your worries that would be beneficial in families and classrooms where it is normal to have children with these issues. At the back there are three tips to helping your child overcome worry that reiterate what is taught in the story. The National Center for Youth Issues generously provided me with a copy of this book upon my request. The rating, ideas and opinions shared are my own. I read all three of these books with my grandson who has anxiety issues. He worries about things that I would not ever have worried about as a young child. Having said that, he told me that he learned “that stuff” in his Road to Resilience Group (he is only 5). I am hoping these skills and the reinforcement through stories, will help him deal with his anxiety. This is a Christian picture book about dealing with separation anxiety. It is a beautifully illustrated story with soft, peaceful pictures of an owl father and his son. The prose is also very reassuring. Quinn is worried about getting separated and lost from his father when they go out at night to hunt. His father takes him to the mountain and talks about it always being there, just like God. 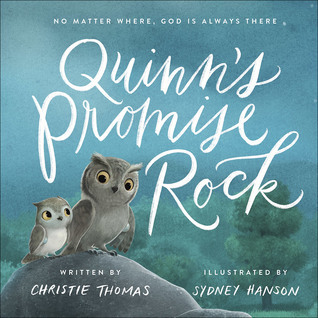 They get caught in a storm and shelter in a cave and once again Quinn listens to his father tell him about the sheltering arms of God and finally, once on the ground, Quinn receives a small rock to symbolize that God is always with him. This is a great book for children to share with them Christian beliefs about God and that he is with them at the times when they may feel anxious or alone. The back of the book has a Note to Parents about using this story along with some bible verses. This book is not going to be for everyone, but is very sweet. The publisher, Harvest House Publishers, generously provided me with a copy of this book upon my request. The rating, ideas and opinions shared are my own. Your welcome Jen. It is something I never would have thought about until my grandson started having issues. Now I realize how important it is and it is so nice to find some stories to help reinforce those skills we can teach them. It’s wonderful that you’re helping him. So many don’t get that! I’m just so appreciative that there are so many books on these subjects for kids. I suppose there were plenty when I was a kid, but I don’t remember seeing many. I don’t remember there being that many when I was a teacher-librarian just 15 years ago, It is great there are so many more choices now. I love your brilliant mini-reviews of children’s books, Carla, and these are no exception. Congratulations on finding three great books on the theme of anxiety, so sad that increasing numbers of young children are already feeling it. I hope your grandson learns to overcome his anxieties and develops coping strategies which work for him. Thanks Elaine. It was something I never would have thought about when I was working and purchasing books for my school library. I also pray that he will either develop good coping skills or outgrow the anxiety, although I don’t think that will happen. Yes it is, and it will be great for those who have mild anxiety and ordinary worries so they don’t get worse. That’s so tough to have to deal with anxiety when you are just a kid. From the ratings you gave most of these books, I would assume that they are good but not life changing. I think when you have an issue like that, that any positive resources you can find are helpful. I agree, they need to be coupled with other resources and activities, but certainly give some great tips. Thanks for these recommendations of books about and for anxious children. Sharing. I’m drawn to these children’s books about anxiety for the same reason as you, a child I love struggles with these challenges (well, I do too). It is such a relief (and a great help!) that these books are coming out nowadays. Children with anxiety issues usually turn into adults with anxiety issues, and the sooner they can learn to handle those challenges, the better off they’ll be in the long run. Great reviews! Thanks Myndi. These are a good start for parents who are at a loss, but also really good for kids who have minor anxiety that we want to keep it that way.